Adidas is getting ready to launch a new colorway for their Adidas F50 Adizero collection. The expected release date for the new colorway is late Octotober 2014. The design follows the same design of the previews F50 Adizero Pink Colorway and 2014 World Cup Adizero, the only difference is the colorway. 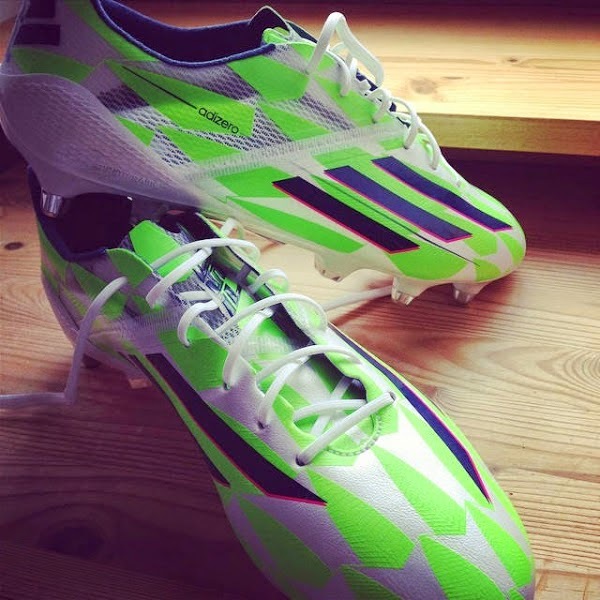 The boot is mainly white with a striking green pattern, while the Adidas branding is navy with some pink details. The upper part of the boot is made of synthetic material and leather for premium comfort. Adidas is also introducing to this boot the new Dribbletex 3D texture for maximum ball control in any weather conditions. The Traxion FG outsole uses Speedtraxion stud alignment for better acceleration in natural surfaces. The expected market price for these boots is $220 dollars in selected retailers.